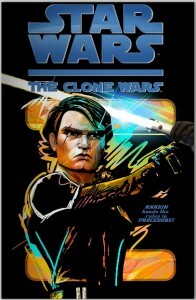 A co-worker sent me this link to a Star Wars: The Clone Wars comic in something called the Star Wars Online Reader. There are three parts to it, each one meant to segue between one of the three Clone Wars TV episodes that have been released so far, and that you can also watch on StarWars.com. I’m assuming they’ll also be adding a new comic each week as a new TV episode comes out. Each episode also has a viewing guide (with detailed synopses), and some of them have commentary. I didn’t actually go see the Clone Wars movie, but some of this stuff is pretty good, and I might have to watch it now. Bonus link: StarWars.com has some weird stuff. Here’s an article on how to make star wars themed cat toys.